Hey there! Thanks for dropping by Into The Abyss! Take a look around and grab the RSS feed to stay updated. See you around! I’m having a low day today. At least, I hope that’s all it is. I am at a point, for the first time in a long time, where i’m feeling short on hope. It’s likely just disappointment gone amuck, but it feels like the beginning of a slide down the wall of a very deep pit. I was sure I had found it, the land we’ve been looking for. The location we wanted, very affordable price, landlord willing to work out a purchase deal…and it slipped right through my fingers. Evidently I ended up in the spam folder and missed my chance. Cruel fate. Winter is fast approaching, and where we are currently can be extremely unkind once it arrives. We’ve been in an extended state of limbo much of this year, always trying to be on our way somewhere, but never quite landing even close to there. It’d be fair to say the destination has remained elusive, and the path murky at best. And I feel myself losing the urge to continue the journey, to even navigate the waters that have yielded little but struggle and loss and lessons to date. The proverbial dark night of the soul, perhaps? So today, I cast my cries on the cyberwinds, curse the darkness, light a candle and pray for the quick return of daylight. So, it’s been a month since our lives literally went up in flames…and thanks to the quick thinking and action of my partner, all was not lost. We’re extremely grateful, as it could have undoubtably ended with much worse results. My heart and thoughts go to the folks going through the Colorado wildfires – now that is a whole other level of fire survival. Our rebuild is still in progress, post-insurance settlement; but we did have a great adjuster, and the claim was settled quickly with little hassle. We also fortunately had almost a week’s worth of hotel points from my previous life as a traveling consultant, which really helped us regroup the first few days. The whole process has been a tremendous reboot for us, truly one of those “blessing in disguise” experiences. It kick-started our remodeling process we had been discussing for a while; forced us to simplify and downsize even further, choosing to live in a work-in-progress RV with no electricity for a while, and still no hot water, refrigerator or microwave (coming soon! ); and caused us to get serious about getting our solar setup in place. As it turns out, the repair guy we initially called for the fridge is helping us with some of the electrical and gas repairs, and is going to be a resource for getting the solar done. He felt so bad about not warning us about the fire hazard that he’s gone out of his way to help us get back up and running. We at least have more of an idea of what it’d be like off-grid, doing without the common conveniences, and we know we can do it and actually be ok with it. We’ve been eating primarily out of a cooler for almost six weeks now (admittedly with more fast food and restaurant runs than we should have, but if that wasn’t an option, we would have been fine too). The one thing we did continually have that may be hard to come by off-grid is running water, but we’ve looked at rain barrel and other systems for that, and we’re still hoping to be near a natural water source when we buy land. We’ve been using a solar shower, heating water for basin baths, or just taking cool showers, since our water heater’s out of commission. I sneak over to my daughter’s house for a lovely long hot shower now and then, but that’s a victory of indulgence over necessity. Well folks – we made it past the weekend, and a good bit of the week, to payday, and actually found a regular electric fridge that would fit the dimensions of the Dometic RV one that quit the Friday before Memorial Day. We paid for it and scheduled delivery for the following Saturday. We even had the audacity to buy the top soil, potting soil and containers to finally start our garden. What we didn’t know is that our crisis moment hadn’t quite peaked. I was sleeping in on Friday June 1 when I heard the smoke alarm going off. It sometimes did so when we were cooking in our RV, but this time it was swiftly followed by a strong odor and a copious amount of acrid smoke. My partner and I began yelling for each other immediately and ran outside. I was still in a fog, having stayed up late finishing a crochet project for my daughter, but thankfully my partner was alert enough to identify the source of the fire right away. He yelled for me to hand him the water hose he had turned on it, ran up on the roof, and began dousing the fire directly. It took him at least 20 minutes or more, but he was able to subdue the fire that raged out of – you guessed it – the dead refrigerator. Evidently it wasn’t as dead as it appeared, since it hadn’t been disconnected from its power sources. Perhaps it should have occurred to us to try to disconnect it when it died – but neither of us are electricians, and the repairman I called said that that process was fairly complicated; it wasn’t like we could just pull a plug out of the wall. My partner was going to attempt it, with his help (bless the repairman – he couldn’t have been nicer, and offered to help us however he could even though we couldn’t afford to have him rebuild our fridge, which would have cost nearly the price of a new one). But that opportunity never came – the fridge decided to spontaneously combust that day instead. Then, as if the brush with death and subsequent loss of our living space weren’t enough – a hole was burned through the side of our closet, destroying many of our clothes, not to mention the A/C unit, microwave and plumbing vents being a total loss – we found out that we hadn’t been insured as full-time RVers, so our coverage was not what we thought. WORD TO THE WISE: if you live in your RV, make sure you get the full-timers package. There’s a big difference between ensuring your vacation vehicle and your home. You’d think i’d be smart enough to have closely verified my coverage when I set it up after the last debacle I had with my auto insurance, but evidently not. The small print matters in such circumstances. I also found, upon consulting the office of the park we had landed in, that I could not expect a refund of my lot rent, even under such dire circumstances. In my zeal to pay my bills as soon as possible, I had paid the rent for the month of June the previous day. Of course. I’m not taking no for an answer just yet, however – I have a call in to their main office to see if I can get some level of compromise. This is one of those times where it makes sense to be the squeaky wheel. I was able to cancel the fridge, and thankfully the store had a 30-day full refund policy. Also, praise Spirit, I had leftover hotel honors points from my traveling days on the job that I hadn’t used, and they bought us five days in a hotel, to our surprise and delight. And since the insurance company informed us that it would take them five days to get out and inspect the RV, that was just enough time to have a place to stay in the meantime that wasn’t wet and covered in soot, with a hole in the side wall. What comes next in this adventure? Well, whatever we get from the insurance company isn’t likely to buy us a new rig, rather less replace what we lost as a result of the fire. The adjuster told us that some Dometic refrigerators were actually on recall, so if ours happened to be one of the models listed, we could possibly get some compensation from them. Meanwhile, i’ll likely pass the garden supplies on to my daughter for her garden, and we’ll hit the Army/Navy surplus store for some camping supplies. If I can’t get a lot refund for June, we’re going to put up a tent to sleep in, salvage and use what we can from the RV until they take it away, and use whatever time we can buy to figure out our next move. Would that that move were to a cabin on some remote land – we should be so lucky. Sooo…we started off the long Memorial Day weekend with a bang – but not the good kind. I reached into the fridge on Friday and noticed it felt warmer than usual. Checked the little thermometer in it and, sure enough, the temp was in the 60s! A little investigation led us to the access panel on the side of the RV, which looked like a refrigeration crime scene. Something had exploded in there, or a hose popped loose that shouldn’t have; either way, it wasn’t hard to figure out the cause of the dead fridge. Being already deeply on the broke side of things, it was time to figure out an interim plan until we could afford a visit from an RV refrigeration specialist (yes, they exist). We started by getting a cooler and ice, as well as storing some items at my daughter’s, while we sorted out what we could cook right away, what could safely refreeze and what could weather warmer temps (basically condiments and fresh veggies). By day 3, we ended up bringing most of the food back from my daughter’s (since a full fridge stays cooler), having dispensed with the things that needed cooking immediately, as well as having figured out the necessary ice system to use our fridge corpse as a big icebox (like Great-Grandma would have?). I’ve heard it said that the Chinese character for crisis actually means danger + opportunity. Turns out that isn’t exactly true, but the concept certainly seems to apply to this situation. After the initial shock of trying to operate without this appliance that we generally assume is a necessary given in today’s culture, I began to contemplate whether this might be a chance to lower our environmental impact AND learn some off-grid survival skills, all in one fell swoop. It’s pretty common knowledge that refrigerators are generally energy guzzlers.I did a little research on the Net to see what other off-griders do for refrigeration, and my preliminary findings indicate that most use some sort of electrical or propane based solution. Evidently, the 12-volt versions (like the RV fridge we just lost) work well with a solar system, particularly if you get one of the really energy-efficient ones. Since i’m assuming the one that died was as old as our RV, I’m willing to bet it wasn’t in that category. So at the very least, if it can’t be reasonably repaired and we can get a newer used one, it should improve our energy usage. We’re hoping the RV fridge specialist either sells ones he rescued and refurbished, or can lead us to someone who has such items. Barring that, we have a decision to make: Do we blow a huge hole in our budget and replace the fridge with a new model, to the tune of $1300+? Not a totally bad idea, since we could likely run it off the solar grid we fully intend to install. Or, do we go the cheap but non-nomadic-friendly route of scouring our local ReStore, Craigslist and Freecycle for a giveaway fridge, and putting it in our new shed on an extension cord? The latter would likely get us by for now, but means we’d have to revisit this dilemma if (when?) we decide to pull up stakes again. Plus, that solution wouldn’t likely buy us any lifestyle improvements, except exercise in the form of extra steps back and forth to the shed. Another possibility, though admittedly less enticing, is to maintain the old-fashioned icebox approach – maybe finding/buying a chest freezer to keep the ice packs in that we’d rotate out of the dead fridge, and using that freezer to keep the frozen goods as well. Not ideal, but feasible – and something we might actually be able to transition to our next destination; perhaps even employ off-grid. My search for other possibilities will continue, the first word on the matter coming from the repair person when i’m able to get them out here next week. Meanwhile, i’m kind of excited at the prospect of what life without traditional refrigeration could look like. My partner suggests that if we had the right piece of land, we could dig a root cellar that we could likely maintain at around 45 degrees. While I love that idea, land of our own seems a pipe dream at this juncture. Whatever happens, I want us to adopt more eco-friendly food management alternatives, like buying fresh fruit and veg as much as possible (until we get the garden going), and eating it in a timely manner; we recently found a great local farm-to-table produce and meat store. Also, rely more on dry goods, canning, dehydrating, and other preservative methods for our primary food sources (my partner also proposed that we build a small smokehouse on our rental lot, but i’m skeptical that the management will approve of that). Adopting such habits would not only give us some extra sustainability skills for the tool box, but also take us a long way toward our goals of eating more healthily and living more naturally. Enjoying the new spot…and the sun! 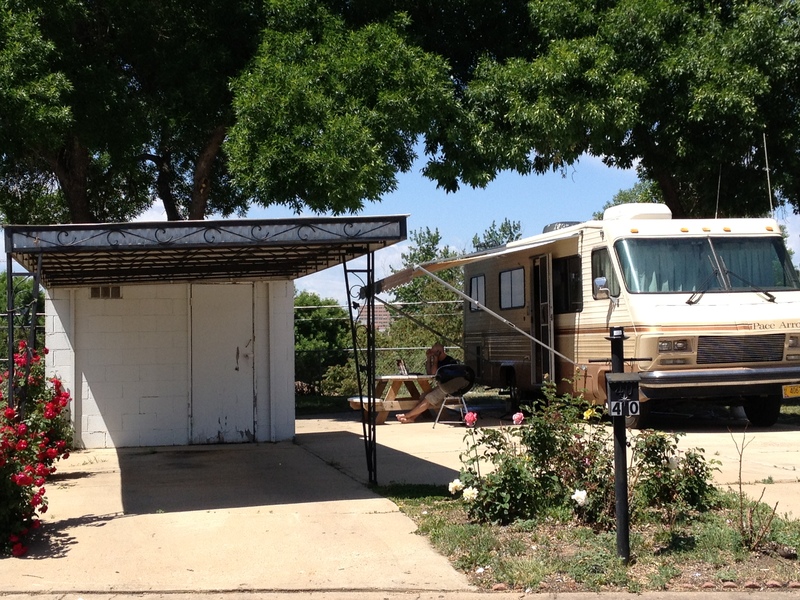 We’re back in the new old hometown, and found a great place to land – a mobile/manufactured home park that accepts long-term RVers, and provides a reasonable monthly rental space with not only an actual decent-sized yard for our garden, but even a brick shed to keep the necessary supplies in. The Universe is good. Haven’t gotten the garden started yet, but it’s on the list for post-Memorial Day. Just waiting to recuperate from the financial drain of moving a large, gas-guzzling car-house across 5 states, so we can afford the basic starter supplies. Meanwhile, I am putting into action some of my homesteading goals – I got a few books to help me get started, including Healthy Bread in Five Minutes a Day and McGee and Stuckey’s Bountiful Container. Admittedly, I tend to love to read about things more than actually do them, but this time I actually got going, partially out of necessity. Turns out making your own bread is a good way to supplement the food budget when money is tight. I know, duh – but before my new interest in sustainability and homesteading, cost cutting on bread would have more likely meant going to the local bakery surplus store. Not only have I made delicious loaves using the VASTLY simplified approach in the Healthy Bread book, but i’ve also used the same dough for pizzas (another good cost-conscious meal option). Very sweet indeed. For the garden, i’m in planning mode, plotting out the best sun-drenched spot in the yard to put it, using the Mother Earth News Garden Planner to visualize the layout. I have become a HUGE Mother Earth News fan in homesteading mode – the newsletters and articles, cheap books, all kinds of earth-friendly resources to help total beginners like me find my way. Priceless. The more I read there, the more I catch myself fantasizing about getting some land, so I can have my mini-farm with chickens, goats and rabbits, reusing greywater, using passive solar, composting, the whole shebang. Baby steps to off-grid…I swear it’s addictive. I’m also trying to figure out a way to collect people’s old used wax – you know, the bits left at the end of the candle or the runoff that usually ends up in the trash. I want to learn to make candles, but rather than buy wax, or try to get expensive eco-friendly materials like soy or beeswax, I thought i’d make it a recycling project, and use old wax to create new candles. My next step is looking into the Freecycle Network in the area, to see if that’s a viable option. I also plan to use Freecycle and Craigslist to get containers and other garden materials (mulch, compost/manure, extra plants) that people might want to get rid of. Free/cheap and earth-friendly seem to often go together very nicely. I know this much about myself after many years of observation – I love starting things, but i’m not much of a closer. Finishing what I start just doesn’t hold the same thrill as launching into new endeavors, for some reason. I’m sure there’s some deep psychological explanation for it, but my mother used to sum it up this way: “Jack of all trades, Master of none”. I’m sure she meant it as a warning of some sort, but I like the idea of it on principle. It’s the same reason I love buffets – you can try a little of everything that looks good, and not fill up on any one thing; the inherent variety of the experience is the true focus. I tell my friends that if I had Oprah-money, I would eat smorgasbord-style all the time, and find a way to let other people enjoy the rest so I didn’t waste food (my own small plates restaurant, perhaps – except not a snooty “foie gras and porkbelly” type place; just yummy food in small portions). Ah yes, but I digress. P.S. – the long trip back to my previous locale is finally complete, and now the search begins anew for a place to hunker down in the RV, start the container garden and such. Crossed fingers and well wishes very much appreciated. Got a little further in the Your Custom Homestead book – in true business plan fashion, the next steps Jill leads you through are your mission statement and one/five/ten year goals (someone’s been to a seminar, maybe?). Ok, i’ll play. To live a life that reflects love for the planet and all those who dwell on it, while facilitating and advocating for the freedom of all to enjoy its blessings. It sounds ambitious, even to me, but achievable if I can find the discipline and commitment to see it through. Being the hippie that I am, I am completely open to the possibility that those goals could be altered significantly as I learn and gain experience on my journey; but I think it’s important to have a vision and be able to state it clearly, if you want to see it manifested. Intention plus energy equals creation. My partner and I live in an RV that we have equipped to be as sustainable as possible, including a diesel engine that can use biodiesel and/or waste oil for fuel; solar powered electricity; a water filtration system capable of converting natural water sources into potable water; and a composting toilet. During the spring/summer growing season, we have a locale to camp on that allows us to grow our own garden or be a part of a community farm or garden. We also hunt and fish or trade for our proteins. We can and preserve enough basics, including making jerky, to ride out the winter in warmer climes, preferably on one of the coasts. Other basics – medicines, household items, etc. – are either homemade or traded for. We live a simple, happy, and healthy life: at times as part of a loving nomadic community, at other times enjoying our solitude in beautiful, natural landscapes across the country; either on state and national parks where we can boondock for free, or perhaps hosted on private land by friends or for bartered rent. Modern day gypsy heaven. I realize my computer doesn’t really fit into that scenario, but if we actually pull that off, I don’t think i’ll have time to miss it. So – I bought the ebook, Your Custom Homestead by Jill Winger, whose blog I mentioned the other day – step 1 toward my nomadic homesteading dream. Hey, you gotta start somewhere, and at $5, it’s low-hanging fruit. 10. I never got over my Green Acres fixation, but I can’t afford the acreage. 9. I want to be able to fend for myself and my family in the coming zombocalypse. 8. I want to learn to make peace, not war, with the planet. 7. I want to eat food that actually gives my body more than it takes away. 6. I want to do what I can to stick it to the “man”, i.e., the capitalist elite that powers the industrial military complex, and all their minions. Damn the man! 4. I’m all about the paradox: “nomadic homestead”. Love it. 3. The more I learn to do myself, the more mad skills i’ll have to barter when the world economy collapses and money is worthless. No, seriously. 2. If we grow our own veggies, my partner might actually eat something besides meat and Doritos. 1. I only know how to swim upstream – if something’s not difficult and slightly nuts, i’m generally not interested. And there you have it. Let’s do the damn thing. An unexpected, encouraging word came to me today from the blogosphere – thanks to The Prairie Homestead (by way of Pinterest – my new favorite virtual indulgence). Jill, the young farmer (and pro blogger) behind this site has a fresh take on the whole homesteading concept that gave me one of those “well duh” moments when I considered it. It also gave me the renewed spark I needed to look at my own sustainability aspirations through fresh eyes. As in, “The _________ Homestead”. Urban, Island, Mountain, whatever – it matters not. Each person can have their own distinct version of the homesteading dream, without necessarily owning the acres of farmland and the big red barn. It’s really all about having the mindset of returning to a natural lifestyle rooted in simple pleasures, fresh food, and good old fashioned physical effort. It’s the antithesis of the advertising-driven capitalist principles we’ve been drenched in from childhood in this culture – “only having the best/most A & B & C = the truly happy and successful life”. Any version of a back-to-nature life that makes you feel more connected to the earth, as well as those you share it with – that reorders your priorities to what truly enhances and enriches your life rather than mires you in debt, dis-ease, and despair – that is success, regardless of the component parts. Here I’ve been struggling with trying to find the most earth-friendly locale, affordable land, cultural kindreds, etc. – the right external environment – when the opportunity to cultivate my homesteading mindset further and allow it to manifest in the world around me, was there all along. Be it through container and/or community gardening, connecting with organic farms and sources nearby, making more of what I eat and use myself instead of buying pre-made, and making what I do purchase as natural and local as I can, I can begin living my homesteading dream, and find contentment in the midst of the small steps. This paradigm shift puts our pending trip back to our previous locale in a whole new light. I have a new challenge, a newly defined target to pursue, which is: what does “The Nomadic Homestead” look like, at least for us? I’m sure there are others out there living their own version of that (note to self – research! ), but for us, it’s uncharted territory – my favorite kind. On this day of Beltane, the festival celebrating the return of fertility and new life to the earth, I have a renewed sense of excitement, as I expectantly await what is to be birthed in this next season of my life. So I can have my nomadic cake, and homestead it too. Who knew? My family member has passed on, and the ordeal I anticipated that experience to be surpassed all my expectations. I entered it hoping to learn and grow as a result. I look forward to the day when I can see such results in retrospect, but for now I feel shattered, drained and scarred. Likewise, my time in the Pacific Northwest is drawing to a close, and I leave feeling as cloudy and dampened as its trademark weather. The immediate plan is to return from whence we came, and determine next steps during our summer there. It will be nice to reconnect with the loved ones I left there, and being in familiar surroundings will also be a comfort. But my internal struggle mounts as I anticipate the trip back, knowing that I am without a clear path or plan, dream or direction, once we get there. I still have a desire to live naturally, more in tune with the earth. I still long for the simplicity and freedom of a modern gypsy’s life. Yet I feel as though i’m peering through a grey fog when I contemplate my future. I’m not sure if i’m just at a necessary point in my transformational process – being stripped of all illusions of control so I can be fully open to whatever the Universe has in store – or if it’s the natural grief process at work, and I just need to yield to its flow until it brings me ashore. Maybe both/and. Whatever the case, i’ve always struggled with purgatory-type states, and this is no exception. And yes, I get the irony of being someone who is box and label averse, yet having a problem with ambiguity, but there you are. However hypocritical, I must own the reality of who and where I am at this stage of my journey, and find the way of peace within it. It occurs to me that my current crisis is, yet again, an issue of trust. I find myself pondering anew fundamental questions: Is there meaning and purpose to my path through time and space, or is it merely a chaotic string of events upon which I am trying to impose order? If there is a true path, is it possible to wander off-course; or is my view is just temporarily obscured, requiring only that I forge ahead? Welcome to the baked spaghetti casserole inside my head at the moment. Someday, hopefully soon, I expect clarity will return. Until then, Quantum Fluidity, over and out.